I’m usually sort of a lone cook in the kitchen. Not that no one else can be in the kitchen, but I just sort of have a system of how I do things and that system happens to have no particular rhyme or reason, or stated order. Which then means that when someone asks if there is anything they can do to help, I have to say no because…well, I’m already in a groove and have no idea what part of the process I could pass off. And I’m perfectly fine with this system, generally. At the same time, as deer season has come and gone, and J and I spent time together in the kitchen processing deer sausage and making deer jerky, I found that I really enjoy spending time with him in the kitchen. It’s fun and it’s good quality time. Recently J was at home one day and I realized that I had a crock-pot recipe on the menu, and there was no way I would be able to make it after work and be able to eat at a decent time. So, I enlisted his help. With a few texts, the sauce was blended and the creamy, delicious chicken was in slow cooker heaven. 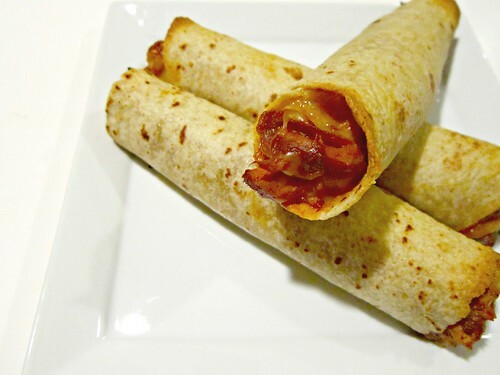 By the time I got home from work, all that needed to be done, was to wrap up the shredded chicken in the tortillas with some cheese and bake those babies up. And it. was. good. Not just kinda good. Like amazeballs good. And we did it together so, that made it even better. Teamwork, y’all. And as J always says that the things I cook are cooked with love, I told him that this particular meal was cooked with double the love. 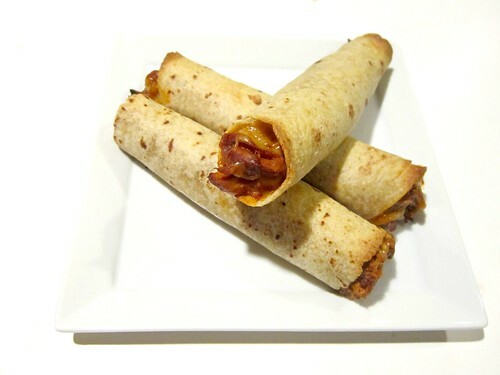 Now before you run away from the mush overload, don’t forget to take these amazing taquitos with you!! For reals, yo. You need these in your life. Trim the chicken of any fat, and place in the crock pot. In a blender or food processor, combine the bbq sauce, roasted raspberry chipotle sauce, cream cheese, garlic and onion powders, paprika, salt and pepper. Blend until smooth and then pour over the top of the chicken in the crock pot. Cook on high 3-4 hours or low for 6-8 hours. When done, shred the chicken with two forks, or remove to a stand mixer and shred with the paddle attachment. Stir it with remaining sauce in the crock pot and allow to cook for an additional 10-15 minutes. Preheat oven to 425 degrees F and line a baking sheet with foil. Spray with cooking spray and set aside. Add approximately 1/4 cup chicken filling to the top 1/3 of each tortilla (the side closest to you) and sprinkle some cheese on top. 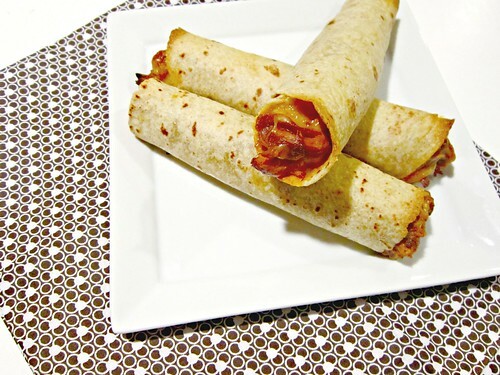 Roll the tortilla tightly, starting with the end closest to you, and place seam side down on prepared baking sheet. You can give them a little spritz of cooking spray to help them brown, if you like. Bake 10-15 minutes or until tortillas begin to brown and get slightly crisp. You can cook longer or turn your broiler on if you like them more crispy.